On a recent visit to Cornwall - the first for many years - I was surprised at how many Welsh words were to be seen on road signs all over the place. Of course, they weren't Welsh, they were Cornish, but the two languages are from the same family of Celtic languages. Most of the words were more or less identical to their Welsh equivalents, with the occasional variation in spelling (a 'g' for a 'c', for example) but there was one that amused me vastly - it was Welsh, but spelled backwards! 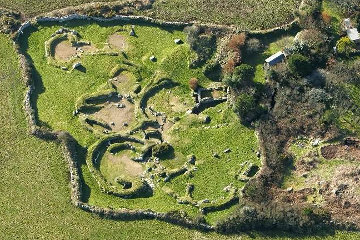 The Welsh for cave is "ogof", but in the ancient village of Carn Euny there is a man-made cave called a "fogou". I read about it many years ago and have long wanted to visit it, so I eagerly followed the extremely narrow and twisting lane - several sharp right-angle bends made me glad I wasn't driving a long vehicle! The road ends at a farm gate, but a sign pointed up a path round the side of the farm and four minutes brisk walking brought us to the cluster of ruins that makes up Carn Euny. The fogou wasn't hard to find and was more impressive than I had imagined from the terse description in the guide book. Tall enough to allow me to walk through standing upright, the fogou is a tunnel about thirty feet long with a doorway at each end. One doorway is set in the middle of a hut circle; the other, which is lower and I had to duck down to pass through it, comes out between two huts. Near the first entrance there is a large, circular side chamber whose purpose is a bit of a mystery. Entrance is free but the farmer's wife was selling "liquid happiness" - milkshakes made with Cornish cream (purchased from the local supermarket, alas), and she happened to mention the luminescent lichen in the fogou. I kept my eyes open and was duly astounded. Although it only reflects light, the green lichen shines like a beacon in the fogou and lights up the walls of the side chamber. If anyone happens to know what the stuff is, please let me know by clicking here.